Learn a little moreAbout Euclid! The Euclid is located at one of the busiest intersections in Clay. Every time I drive by, I see that their parking lot is packed! So if you can’t find a spot in the parking lot you can go across the street to the overflow parking. The fact that they have an overflow is a sign of a great restaurant! The square restaurant is a trendy eggplant color, and the signage in front informs you that they serve steaks, pasta, chicken, prime rib, fresh seafood, chops, and cocktails– and at the time of my visit, festive Halloween decorations reminded us that it was fall in central New York. I have seen them decorate for every season so you know they cater to families. My dining companion, Brooke, and I arrived on a Thursday evening around 5:30. We were greeted by Sylvia, the restaurant manager. I asked Sylvia if they accepted reservations and she said they did. I really like knowing this. I hate waiting. To be quickly seated at a busy restaurant like this, I will call ahead every time! Sylvia seated us in the main dining room, where we were introduced to Mary our server. The dining room was decorated with yellow and rust colored flowers and orange and black plastic pumpkin heads were hanging at each table. The dining room was all ready bustling with early diners. Mary was kind enough to make a couple of recommendations for our appetizers. I chose the shrimp cocktail ($5.99) and Brooke decided on the bacon wrapped scallops ($6.99). I sure was hoping Brooke would share her scallops with me! We also found out that Mary has been employed here for 28 years. I should have known- she never wrote anything down and nothing was missed! Just before Mary came back with our appetizers she took our entrée orders. There were so many delightful choices: salads, pizza, Italian dinners, steaks, seafood, low carb, sandwiches, and over twenty side dishes to select from, not to mention the daily specials! I decided on the Baked Cheese Raviolis with homemade sauce ($10.99) and Brooke selected the Queen Cut (12oz) Prime Rib ($16.95). Our appetizers were delivered promptly after we ordered dinner. Brooke’s scallops were cooked perfectly. The bacon was crisp on the outside and the scallop was soft and succulent. This is a classic combination that never goes out of style. I can’t tell you how long it’s been since I have had a shrimp cocktail. The shrimp was fresh and chilled with more than enough cocktail sauce. I have always asked for extra when I order shrimp, but there was no need this time. The basket of warm fresh bread was then brought over. There was regular white bread and some long round bread sticks with a dusting of parmesan cheese on them and served with real butter. Our salads were promptly brought to us after the yummy appetizers. I do have to mention that I heard every table around us call Mary by her name. I don’t think I have ever noted that before. I have been told my waitress’s name before and if they were not wearing a name tag I couldn’t remember it. I don’t remember Mary wearing a name tag. I can only assume diners remember Mary for the excellent waitress that she is! I had to try one of the dressings they make here at the Euclid. It was a creamy blue cheese. I was not disappointed. It had a great blue cheese flavor and I didn’t have to share it with an Italian dressing. The salad was served in a bowl with iceberg lettuce, a slice of tomato, shredded carrot, and a little purple cabbage. I always prefer a salad served in a bowl vs. a plate. I find when a salad is served on a plate and you need to cut it up, it flies off the plate onto the table or into my lap. While we were waiting for our entrees, I decided to go upstairs and check out the Banquet Rooms. There are two, one that seats ten to 100 people, and the Private Room that seats ten to 35 people. What a great place to host a rehearsal dinner, shower, birthday party, a company party, or anniversary party. Just as I came back downstairs, our dinners were served. I had to do a double take on the size of Brooke’s queen cut prime rib! The menu said it was a twelve ounce cut. I didn’t have a scale with me but it looked more like 16 to 20 ounces. It was a done to a perfect med rare and the marbling was pretty much an insurance policy that this prime rib was going to taste amazing. Brooke confirmed it was one of the best pieces of prime rib she has ever eaten. She had chosen a baked potato as her side. It was still steaming as it was delivered to the table. My baked ravioli filled my plate completely and was covered in bubbling melted cheese that was a little brown around the outside edge. I love that part! Inside the little pockets of pasta was a light, fluffy ricotta cheese, complimented by the thick rich tomato sauce. The sides were delivered on separate plates. I had no idea where I was going to fit all this food! I did notice every plate that passed our table had huge portions. Every fish dinner that went by had a piece of fish that over hung the plate on both sides. If you leave this restaurant hungry it is your own fault. Once we finished as much as we could, we had to start thinking about dessert. That’s not hard to do because they had so many to choose from. All of the cream pies here are made on the premises. Brooke and I decided to split a piece of the peanut butter pie ($3.95). Who can resist rich chocolate, creamy peanut butter with roasted peanuts and caramel? There was no better way to end this wonderful experience. This pie had layers of chocolate, peanut butter and a chocolate gnash filling topped with roasted peanuts and gooey caramel. The only way it could have been better is if I ordered a scoop of vanilla ice cream with it. Too bad it was an afterthought. After saying goodbye to a wonderful staff, Brooke and I walked thought the bar area and noticed there was not one empty bar stool. 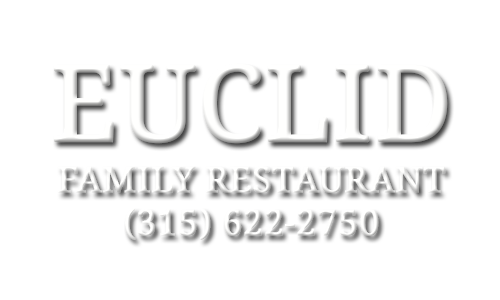 If you are looking for friendly faces, great food with large portions at great prices the Euclid is a must try. I know you will enjoy it as much as we did.